When Alaskans in the 1950s demanded an end to "second-class citizenship" of territorial status, southern powerbrokers on Capitol Hill were the primary obstacles. They feared a forty-ninth state would tip the balance of power against segregation, and therefore keeping Alaska out of the Union was simply another means of keeping black children out of white schools. C.W. "Bill" Snedden, the publisher of America’s farthest north daily newspaper, the Fairbanks Daily News-Miner, helped lead the battle of the Far North against the Deep South. Working behind the scenes with his protege, a young attorney named Ted Stevens, and a fellow Republican newspaperman, Secretary of Interior Fred Seaton, Snedden’s "magnificent obsession" would open the door to development of the oil fields at Prudhoe Bay, inspire establishment of the Arctic Wildlife Range (now the Arctic National Wildlife Refuge), and add the forty-ninth star to the flag. 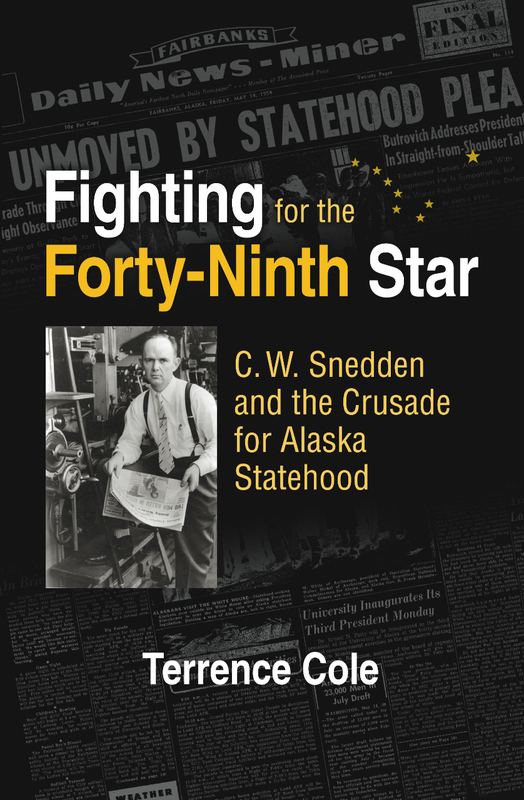 Fighting for the Forty-Ninth Star is the story of how the publisher of a little newspaper four thousand miles from Washington, D.C., helped convince Congress that Alaskans should be second-class citizens no more. Chapter 8 "We are Right and Congress is Wrong"
Chapter 9 "Giveaway McKay" and "The Garbage Man"
Chapter 10 "Start Acting Like Ladies and Gentlemen"
Chapter 12 "Second-Class Citizens" and the "Lunatic Fringe"
Chapter 14 "The Lord and Lyndon"
Chapter 15 "A Snowball in Hell"
"It was not easy to bring a new state into the Union, and the story of Alaska’s battle to win that privilege is a fascinating tale of idealism, courage, and fortitude in the face of unrelenting hypocrisy, racism, and bigotry. In the hands of Terrence Cole, who builds on the foundational work of scholars such as Claus-M. Naske, the tale makes for a lively read and an intriguing new slant on just how the 49th state came into existence."